Thallus: foliose, small to rather large, 2-4(-5) cm wide, rounded or unilaterally developed, loosely adnate, distinctly and deeply lobate lobes: short to extended, 2.5-1.5 cm wide, 130-350 µm thick when moist, apically broadened, rather few, repeatedly ±furcate or palmately branched lobules: elongated, 0.5-2.5(-4) mm wide, linear, usually convex and canaliculate below; tips: often broadened and ±flat, entire or crenate, not distinctly swollen and plicate upper surface: olive-green, usually not black, dull or slightly glossy, epruinose isidia: absent or present, few or abundant, at first globose to terete, finally scale-like lower surface: concolorous or somewhat paler, with white tufts of rhizines Apothecia: often numerous, 0.5-2 mm wide, usually broader than the lobules, adnate or sessile with ±constricted base disc: plane to slightly concave or convex, smooth, reddish brown, dull or slightly glossy, epruinose thalline exciple: thin, entire or slightly crenate, inconspicuous or slightly prominent, lacking a pseudocortex proper exciple: thin, euthyplectenchymatous or sometimes subparaplectenchymatous hymenium: hyaline, 6590 µm tall asci: clavate to subcylindrical, (6-)8-spored ascospores: hyaline, ±ellipsoid with acute or obtuse ends, 2-celled, rarely indistinctly 4-celled, not constricted at septum, (8.5-)12-22(-24) x 4-7(-8.5) µm Pycnidia: laminal or marginal, immersed, pale conidia: bacilliform, with slightly swollen ends, 5-6.5 x 1-1.2 µm Spot tests: all negative Secondary metabolites: none detected. Substrate and ecology: on siliceous and calcareous rocks at low to high elevations World distribution: SW North America, the Caribbean, South America, China, India, Japan, and Socotra (Yemen) Sonoran distribution: southern and central Arizona, throughout Sonora and Baja California Sur, Chihuahua, and Sinaloa. 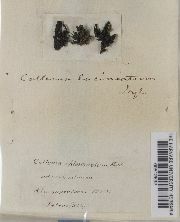 Notes: Collema texanum's elongated, repeatedly branched, canaliculate lobes with down curved margins and its 2celled ascospores are characteristic. Tongue-shaped, canaliculate lobes are also found in Digitothyrea that may grow side by side with Collema texanum. Digitothyrea differs, however, in its jet black thallus color, its coccoid cyanobiont, and its apothecial and pycnidial characters.